Shearwaters and petrels make their nests in the ground. This means they lay their eggs in small burrows in the ground. Do not be alarmed if you see a shearwater or petrel chick outside of their burrow; they usually come out to exercise at a young age. The parents will return with food later that night. 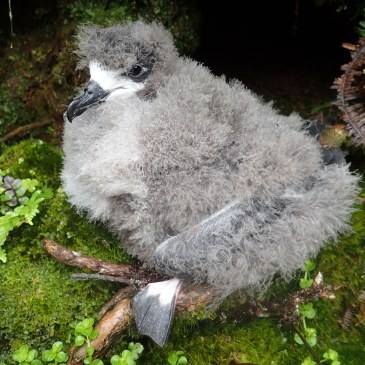 Save Our Shearwaters can only rehabilitate native species. If you are concerned about a bird or are unsure of the species please call the SOS hotline at (808) 635-5117 before picking up the bird. Keep an old clean towel and a ventilated cardboard box, pet carrier or other non-airtight container in your car. Gently pick the bird up from behind with a towel, carefully wrapping the bird completely around its back, wings, and head. Watch the beak! It can be sharp and powerful. Keep the bird covered and in a quiet, shaded or cool location. Do not handle the bird unnecessarily, they are easily stressed and can overheat. Do not give food or water to the bird. Do not attempt to release the bird yourself. It may have internal injuries or be too tired or weak to survive. Throwing the bird into the air could cause more injury. Let the trained Save Our Shearwaters program staff examine the bird and decide when, where and how to let it go. Take the bird to the Kauai Humane Society if possible. If you are unable to bring the bird to KHS, drop the bird off at the nearest aid station (listed below). Remember, aid stations are only available from September 15 to December 15. Fire stations are provided with pet carriers in the off-season so that seabirds can be dropped off year-round. It is against the law to keep or care for any wildlife in Hawai‘i without rehabilitation permits, even if you plan on releasing them. When dropping off a bird, please write where the bird was found on the box or on the whiteboard provided at aid stations. If you are in a rush or are unsure of the location you found the bird, please provide a contact number.